What is « intuitive biomimicry » ? This is a declination of biomimicry. Biomimicry is the imitation of the models, systems, and elements of nature to create productive systems and performant technologies. Intuitive biomimicry gets the inspiration from nature, from all vegetal and animal interactions, in a sphere built of interconnected meshes that inspire balanced lessons as an individual, and collective lessons in adapting with our environment. Develop these learning guidelines in a defined environment to include humans in harmony, similar to a description in nature called: Biocenosis (or biological community). It describes the interacting organisms (vegetal, anima and bacteria) living together in a defined habitat – biotope – through their organizations and interactions. A deep exploration to reopen natural doors to learning with the genius of this organised chaos, can be studied in its engineering, social form… but also in its more subtle form: intuitive. A form that reconnects us in depth with our senses, our answers buried deep down our core being, our soul. An approach to learn again how to watch, feel, integrate consciously vital values that that have proved successful in an environment naturally rich in its diversity. We are connected to this nature that is our source of inspiration and creativity, and must learn again to consciously see, listen and feel who she is. A large number of discoveries have had symbolically a striking moment of connexion with nature and its interactions, before becoming a mathematical formula, an invention or event a pragmatic analysis. The exceptional encounter and interaction with dolphins in their natural habitat is one of the many keys that allows us to reconnect with our senses, our authenticity, listening to our own pace and the one of our environment, to live the now and reconnect with the joy of our inner child. Today, our planet is threatened by our disrespectful acts towards nature, and still paradoxically keeps us alive with unconditional inspiration. 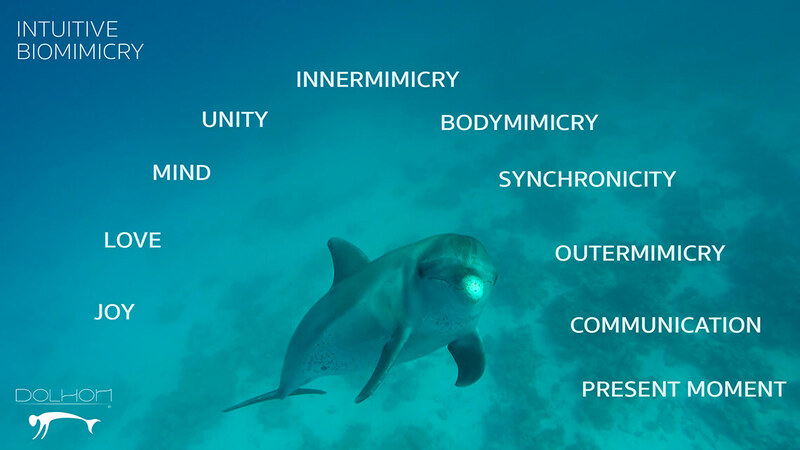 Dolphins and the animal kingdom in its wider view, give us a chance – by biomimicry – to find our «true nature » back.